Pep Guardiola came into the Premier League with huge reputation last season and many thought he was going to wave his magic wand and take the Premier League by storm but after winning his first six games he was brought down to earth by a 2-0 loss at White Hart Lane by a brilliant Spurs side. Jose Mourinho and Pep Guardiola was widely tipped to reignite their bitter rivalry in Manchester and fight for the Premier League title, but both managers were stunned by Chelsea manager Antonio Conte who led the Blues to their second title in three years. Although, the Special One added two trophies to his cabinet last season having won the Europa League and the EFL Cup, but Pep Guardiola could only guide the Citizens to a third place finish in the League and ended trophyless for the first time in his managerial career having enjoyed unprecedented successes at Barcelona and Bayern Munich. The Spaniard struggled to imprint his Tiki-taka style that has brought him success over the years in England last season, but after letting all his full-backs leave in the summer, he invested heavily in his squad having brought in players that will suit his philosophy like Kyle Walker, Benjamin Mendy, Danilo, Bernardo Silva and Ederson. However, what difference a year makes, City and United have set the pace for others to follow so far this season with both sides tied on the same points after seven games, but Manchester City sit top of the table with a superior goal difference. The players seem to have settled in well and gotten a grip of Guardiola’s philosophy and the Citizens have been faultless so far this season scoring goals for fun , majestic in display and are also keeping it tidy at the back having conceded just two goals in seven matches. One of City’s Achilles heel last season was their defence having relied too much on the aging and injury prone Vincent Kompany, but John Stones have had a fine start to the season having stepped up in the absence of Captain Vincent Kompany and has forged a good partnership with Nicholas Otamendi. 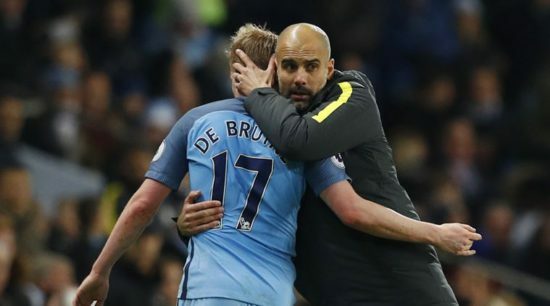 Manchester City’s attacking talent give them an edge over their rivals with the likes of Aguero, Gabriel Jesus, Sterling, David Silva, De Bruyne and Leroy Sane playing out of their skin, they will be a handful for any defence in the league and would be difficult to stop and would be key in their hunt for silverwares this season. A dominant display against Champions Chelsea away at Stamford Bridge last weekend showed how fearless City have become and why they are favorites to win their first Premier League title in four years.